Veterinary technicians assist vets in diagnosing and treating animals in private clinics, animal hospitals, and research facilities. The job includes testing blood, urine, stool, and other samples, administering vaccines and other medications under a veterinarian’s direction, administering anesthesia and otherwise preparing animals for surgery, and any other task necessary to help vets with the care and treatment of animals. Veterinary technicians require specific training and must be licensed, as opposed to veterinary assistants, who are not able to perform tests or administer medications, among other limitations. Veterinary technicians serve veterinarians in ways that are similar to what laboratory technicians and nurses do for doctors. Veterinary technicians assist with the treatment of animals by taking medical backgrounds from their owners and helping to administer treatments or medications. They also test blood and other samples as necessary. Specific responsibilities may vary depending on where a veterinary technician works. For example, those working in small private practices serving family pets likely will spend more time assisting veterinarians with treatments and working with pet owners. Those working in research laboratories, however, might spend more of their time in a laboratory setting, performing tests. 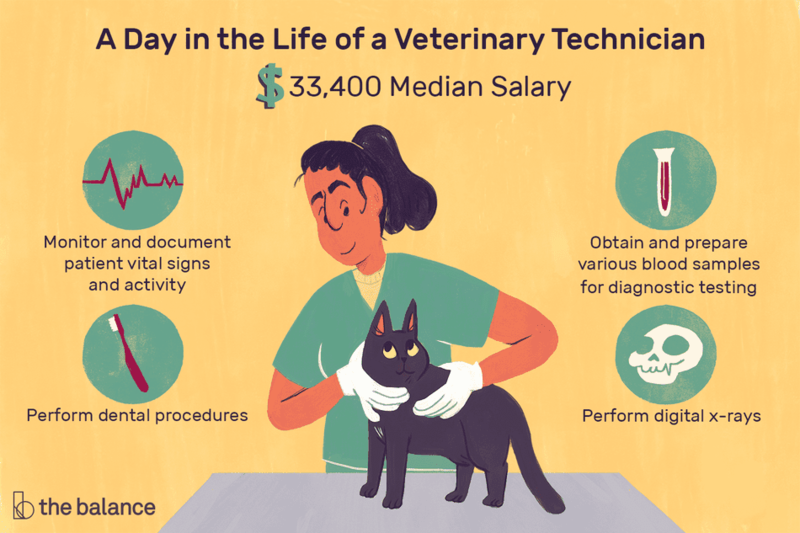 Veterinary technicians working in research tend to earn more money those working in offices serving family pets. A bachelor’s degree is not necessary, but veterinary technicians do need to complete a two-year program and pass an exam to become certified to work in the state where they live. Education: Aspiring veterinary technicians earn an associate’s degree from a two-year veterinary technology program that has received accreditation from the American Veterinary Medicine Association (AVMA) Committee on Veterinary Technician Education and Activities (CVTEA). A list of accredited programs in the United States and Canada on the AVMA website: Veterinary Technology Programs Accredited by the AVMA CVTEA. Certification: Licensing requirements for veterinary technicians vary by state. The American Association of Veterinary State Boards (AAVSB) administers the Veterinary Technician National Examination, which typically is required. AAVSB maintains contact information for licensing boards in the U.S. and Canada on its website. Training and experience: Formal training typically includes laboratory and clinical work with live animals. High school students interested in the field should take science classes such as biology and math classes. It’s also a good idea to volunteer at a veterinarian's office or an animal shelter to gain experience. In addition to formal training, there are personal qualities and soft skills that will help veterinary technicians succeed in the field. Active Listening: Veterinary technicians need to be able to follow the instructions of supervising veterinarians and sometimes pet owners if dealing with them directly. Verbal Communication: Technicians also must be able to convey instructions to clients and veterinary assistants. Organizational Skills: Veterinary technicians need to keep track of lab specimens and medications for multiple animals. Teamwork: Working alongside veterinarians and veterinary assistants requires the capacity to coordinate actions with theirs. Stamina: Veterinary technicians are on their feet most of the day, and sometimes they need to assist with restraining animals during treatments or when taking blood. Compassion: Veterinary technicians sometimes are working with animals who are sick, injured, or even dying, and their owners can be distraught. It’s important to remain professional while still making animals and their owners as comfortable as possible. Demand for veterinary technicians is expected to increase in the near future due to an increase in the number of households with pets, according to the U.S. Bureau of Labor Statistics. Job growth is projected at 20 percent for the decade ending in 2026, nearly three times as great as the 7 percent growth projected for all occupations. BLS also describes the degree and credential requirements as relatively high, meaning jobs should be available for those meeting the standards for employment. Much of a veterinary technician’s work is done in a laboratory setting, but technicians also might assist veterinarians with exams and procedures when necessary and relevant. Those in this career get to play a role in helping sick and injured animals, but it also can be difficult work. The job sometimes includes dealing with aggressive, frightened, abused, or injured pets, and may require assisting veterinarians with euthanizing animals. Work is typically full-time, and hours depend on the nature of practice, clinic, or laboratory where a veterinary technician is employed. Practices that have weekend or evening hours typically will expect technicians to take some evening and weekend shifts. Other practices or laboratories might be open only during standard business hours. Before pursuing a career working with animals, volunteer or get a part-time job at an animal shelter or veterinary clinic to be sure it is the right path to take. An associate’s degree in a veterinary technology program is necessary. Check state licensing requirements and take the appropriate test. What Health Technologist and Technician Careers Are There?